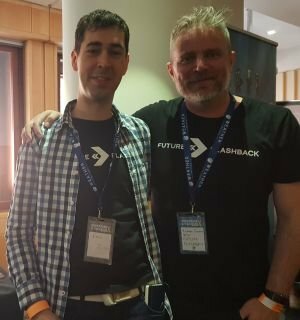 Following our debut report out of London, our three-part AdventureX coverage continues! Watch the kind of scuzzy sci-fi worlds of Blade Runner and Dark City come to pixelated life in Myths Untold’s retro-styled point-and-click adventure Future Flashback, where you play as Kyle, an ex-surgeon addicted to a drug capable of recreating vivid memories. The jaded former doctor wants to relive the last time he saw his son alive, before it all went wrong. But suddenly he starts seeing the memories of a girl he’s never met – and things only get weirder from there. 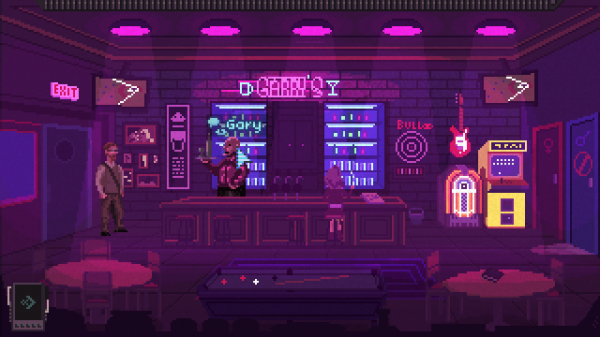 Future Flashback relishes its neo-noir influences, and this is never more apparent than in its beautiful pixel art, all brooding purples and reds and blues and greens. In the short segment I played, Kyle picked up his latest stash of Memory Bombs (not the drug’s actual name in the game, though one I am willing to sell for a small fee!). As he neared the seedy bar in his hover car to a soundtrack of ‘80s synth, pixelated rain drove across the screen, illuminated by looming neon signs for commodities and virtual landscapes. It’s a very impressive scene setter for this alien and yet also recognizable world. Having quaffed and/or snorted said Memory Bomb, I was transported back several years to Kyle’s apartment and presumably a happier time. It was here I got to grips with solving a fun puzzle about cracking a safe in the flat, which involved scouring messages about the perfect drink on Kyle’s phone and laptop, and mixing cocktails to the right consistency until I found the correct one. Interaction is through simple-left click on objects, which then lets you talk, pick something up or look at it through the respective mouth, hand or eye cursors. It looks like Kyle’s phone will play into the puzzles a fair amount, whether by using its “find my key” app, text messages or notes. Myths Untold plan to release this stylistic adventure game at some point in the second half of next year on Windows, Mac and Linux, and hopefully Android devices. You can find out more at the game’s official website. Stories, not swords, are your weapons in the narrative RPG Talesinger: Voice of the Dragon. The Romans are invading Wales and the end of the Celtic way of life is nigh. But all may not be lost: playing as an apprentice bard named Gwen, you have the power to use words to inspire your people once more – could it be enough to start a last ditch attempt to save life as you know it? The team behind Talesinger has a rich pedigree in creating charming open worlds. Both Ralph Ferneyhough and Chris Payne worked together at Traveller’s Tales (Lego series) before starting up Quantum Soup in 2016. 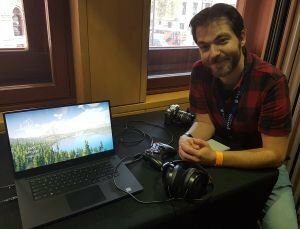 Their passion for stories, combined with a tongue-in-cheek warm humour, was evident in the short demo I played at AdventureX. Gwen is performed with a bubbly Welsh brogue that makes her instantly likeable. Those charms soon come in handy, as she needs to wake up a snoring bard and persuade him to let her become his apprentice in the art of wordsmithery. Two key game mechanics were introduced in my quest to convince the snoozing poet to be my new mentor. First I had to find particular ingredients (e.g. birch bark and mint leaf) dotted around the forest to concoct a fire charm to make him a delicious breakfast. I used a controller to move Gwen freely around the lush 3D landscape, with a navigational compass at the top of the screen showing me the rough location of quest-related items. As well as their biological names, ingredients are grouped into families such as “renewal” or “death”. Chris told me this is so that when more complex ingredients come into play, the player has a clear idea of where to find their items. For example, “death” objects will be easily found at a graveyard, whereas you might find a “renewal” related item in the house of the couple you’ve heard through the grapevine has just recently had a baby. It’s a neat way to bring puzzle solving into what can normally be a straighforward scavenger hunt, and it’ll be interesting to find out how it’s developed further. After setting the poet up with some hot grub, it was time to do what came naturally and use my words to persuade him to take me on as a pupil. Much like in Skyrim, which is a big inspiration for Talesinger, there are various trees for different styles of dialogue (“snappy”, “flattering”, “diplomatic”, etc). In another nod to Bethesda’s epic, crafting certain charms will also unlock further dialogue. Whilst shying away from traditional RPG combat, in the full game the team also hopes to make it possible to unleash your bard talents for special boss battles, performing interactive songs to entire villages to try to encourage them to take up arms and fight with you, or flee and evade capture. 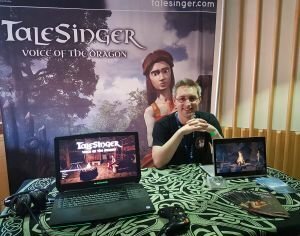 The aim is to release Talesinger: Voice of the Dragon within the next two years on PC and hopefully consoles. There’s more information on the game’s official website, and if you like what you see you can contribute to its crowdfunding page as well. In Lake, Meredith Weiss hasn’t been back to the sleepy Oregon town she called home for many years, but now unforeseen circumstances mean a trip back to a time and place in her life she tried to leave behind long ago. With her job in the big city far away, she takes up a position as the town’s mail clerk, but the reason behind her sudden reappearance still remains shrouded in secrecy. It all sounds like quite an inauspicious start to an adventure game, but that seems to be just how its indie developer Gamious wants it. In the demo, I trundled Meredith through the town in her mail van delivering letters to houses, the bright sunshine gleaming through the trees and not a cloud in the sky. 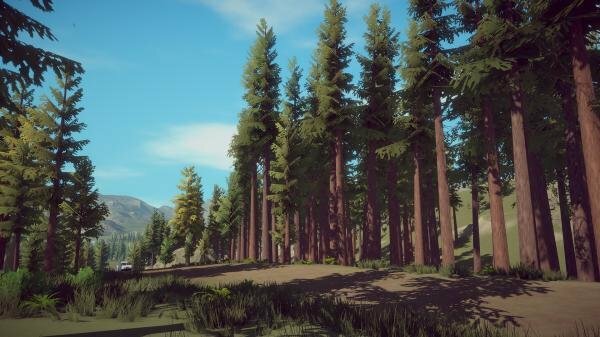 The escapist quality of Firewatch sprang to mind, and although you’re driving rather than hiking through the stylised minimalist 3D vistas, there’s still an element of leaving the city behind and getting back to nature at play. At the end of my mail run, I came across a local resident who I could choose to talk to (all conversation is voice acted). This revealed various dialogue options and different ways to react to the news he gave me about a package I’d delivered which had gotten broken in transit. Although driving around and delivering mail will take up a chunk of your time, it’s this character interaction the game hopes to build on, allowing you to learn people’s daily routines and choose which characters Meredith spends more time with, in amongst all those postal duties. I only drove around a small corner of the map when I played, so here’s hoping that the full environment has lots of varied locations to explore. The team believes it could be another year before the game is released, with PC confirmed and consoles a maybe for now. To learn more in the meantime, visit the game’s website for additional details.